Comfortable Women’s Wedge Heels – Tusbo Stlye! I absolutely love Tsubo shoes! Every pair I’ve owned has been a go-to shoe for comfort and style. 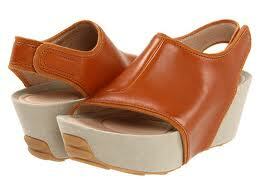 What’s great about these two wedges are that they have a thick, rigid sole that is very protective of your foot joints. more comfort and less chance of injury. Not to mention prettier feet! The Barto shoe is superior because it has forefoot, midfoot and rearfoot control, which allows for more biomechanical control. The Tsubo Sedna lacks midfoot control but has rearfoot and ankle control, which makes it an amazingly comfortable wedge sandal. The Sedna is a particularly good shoe for anyone who has a large bump on the top of their foot (exostosis) and can’t have any pressure on it. Are you starting to develop bunions or hammertoes? Are you concerned about stopping or slowing the progression of foot deformities such as bunions and hammertoes? To do this, it is imperative that you only wear shoes with a thick rigid sole that has forefoot, midfoot and rearfoot control. These Tsubo wedge sandals are a great option for women who want fashion, height and comfort while not wanting to cause their bunions or hammertoes to get worse! I hope this was helpful and I would love to hear any feedback on your experience with these shoes! Voted “Top Doctor” in Phoenix Magazine’s April 2010 issue, Dr. Cathleen A. McCarthy discusses and recommends shoes for people of all ages with a multitude of podiatric problems.